It’s World Gin Day this Saturday, and what better way to celebrate than with the unveiling of the Hands Free Hectare Gin. A 30-bottle batch of Merywen gin, flavoured with barley from the world’s first hands-free crop, has been produced by North Star Distillery, in North Wales, in conjunction with Harper Adams University. Hands Free Hectare Gin is not for sale, but will instead be sampled by key sponsors and others involved in the Hands Free Hectare project, as a token of the university’s appreciation. The gin had its test outing at a function on June 2nd, attended by various members of the HFH team and sponsors. Harper Adams University researcher Jonathan Gill, who led the gin-production project, added: “We have wanted to make beer since we successfully harvested the Spring Barley last autumn, but brewing takes time. The benefit of gin, in addition to its current soaring popularity, is that it can be flavoured over a much shorter time frame. The Hands Free Hectare has attracted attention from across the globe since the project started in October 2016. The 'Hands Free Hectare' project, which will see a crop exclusively farmed by robots for the first time in the world, is well under-way, with the team having already selected the key machinery required to reach their goal. Jonathan Gill, researcher at Harper Adams University, said: "We've created a prototype and tested the automation system on an electric all-terrain vehicle in the field. We've proved that it can drive up and down in a consistent straight line; this is what we aim to achieve during our first task of planting the crop." Jonathan added: "The project, and engineering as a whole, comes down to specifications and this is definitely true with this project. The requirements of the entire system need to account for the crop row spacing, even the shape of the field, to coordinate with the tractor and machinery available." Martin Abell, from Precision Decisions, the project's industry partner, said: "The selection process has been very important and time consuming." "The drill that we'll be using is a vineyard drill which is normally used to add green manure (cover crops) between vines to help the soil retain nutrients. The coulters and seed metering mechanism are identical to those used on conventional versions of the drill and so it suits our application perfectly." "The spray system that we've selected is not only appropriate for the tractor, giving sufficient capacity to cover the area, but also works with common agricultural practices. " "We're going to use a conventional sprayer controller, the same system that can be bought by a farmer. This means the sprayer will be a self-contained unit, looking after itself while the tractor navigates the hectare." "We've also turned our attention to safety. It is incredibly important that we have safety systems enabled in the unlikely situation that something goes wrong. The machines will not be radio-controlled but act autonomously. We've found laser scanners which will monitor the front of the tractor and stop it should anything be too close. "It's been a challenge to find systems that work with our vehicles in conditions that robots aren?t normally put in. For example, actuators supplied by Linak, help to control the transmission and other functions in tough environments." Alongside preparing the tractor for drilling in a couple of months? time, the team are also focusing on creating a mission control. This will provide a platform to see the field in real-time and supplement feedback from the robots whilst working. Due to the popularity of the project, the engineering department are helping the project by providing a camera that will be fixed to the outside of mission control. Here they are hoping to 'live-stream' important events in the field. They anticipate that they can use renewables to power the cameras. Jonathan commented: "We've had more in-kind sponsors join the project since we started in October. They are very excited to be a part of this project and have been incredibly generous. We're very thankful for their help." Martin added, "It's great to see more people believing in, and wanting to support the project. Now that we are a quarter of the way through, I feel that people can really see we have the momentum behind us to make this project work." 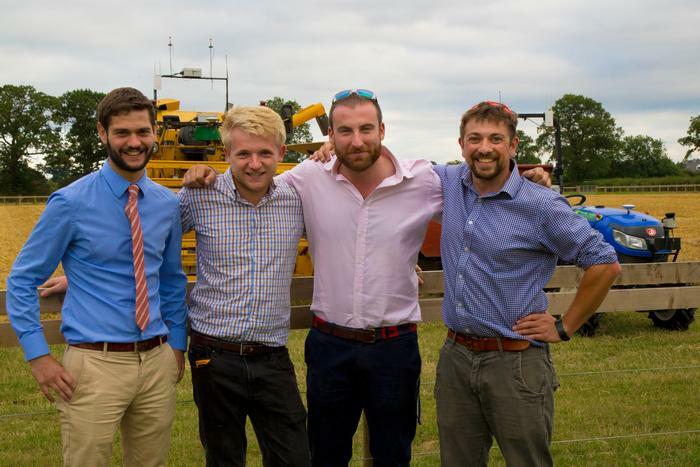 ​In a world-first, members of Harper Adams University engineering staff, supported and led by precision farming specialist Precision Decisions Ltd, are attempting to grow and harvest a hectare of cereal crops; all without stepping a foot into the field. The project entitled 'Hands Free Hectare' has recently got underway, with the team having to create their first autonomous farming machinery, ready for drilling a spring crop in March. Kit Franklin, one of the researchers, said: "As a team, we believe there is now no technological barrier to automated field agriculture. This project gives us the opportunity to prove this and change current public perception". "Previously, people have automised sections of agricultural systems, but funding and interest generally only goes towards one single area. We're hoping to string everything together to create one whole system, which will allow us to farm our hectare of cereal crop from establishment to harvest, without having to go into the field. " "We are confident that we are going to be successful implementing current open source technology, but obviously there is an element of risk. This is the first time in the world that this has been done but pushing boundaries is what engineering research is about." "We will be using small-scale machinery that is already available on the market, and adapting these in the university?s engineering labs ready for the autonomous field work." "We will be drilling a spring crop in March. April to July will comprise crop husband activities with remote agronomy and autonomous application of required inputs and then harvesting in August and September." On why this project is important, Kit added: "Automation is the future of farming. We?re currently at a stage where farm machinery has got to unsustainable sizes." "Over the years agricultural machines have been getting bigger increasing work rates. This has suited the UK's unpredictable climatic working windows and reduced rural staff availability." "But with these larger machines, we are seeing a number of issues, including reduced soil health through compaction which hinders plant growth, as well as reduced application and measuring resolution, critical for precision farming, as sprayer and harvesting widths increase." "Automation will facilitate a sustainable system where multiple smaller, lighter machines will enter the field, minimising the level of compaction. These small autonomous machines will in turn facilitate high resolution precision farming, where different areas of the field, and possibly even individual plants can be treated separately, optimising and potentially reducing inputs being used in field agriculture." "It's not about putting people out of jobs; instead changing the job they do. The tractor driver won't be physically in the tractor driving up and down a field. Instead, they will be a fleet manager and agricultural analysts, looking after a number of farming robots and meticulously monitoring the development of their crops." The project's main partner is Precision Decisions Ltd. Clive Blacker, managing director and Hands Free Hectare project lead said: ?The opportunity to convert our current experience of autosteer and precision agronomy solutions and embark on an autonomous solution is very exciting. "Automation undoubtedly will become a large part of agriculture?s future. By working with Harper Adams, the leading global centre for agricultural robotic research, this allows us to understand the challenges autonomous solutions bring and to develop new tools and services from this opportunity." "What we learn from this experience is fundamental in allowing us to fulfil the needs of tomorrow`s farmer, to fully embrace the digital revolution we face today." Funding for the project is being provided through the Innovate UK - Satellites and agri-food competition. This competition is providing funding to projects aiming to improve the productivity of agri-food systems using satellite technology.